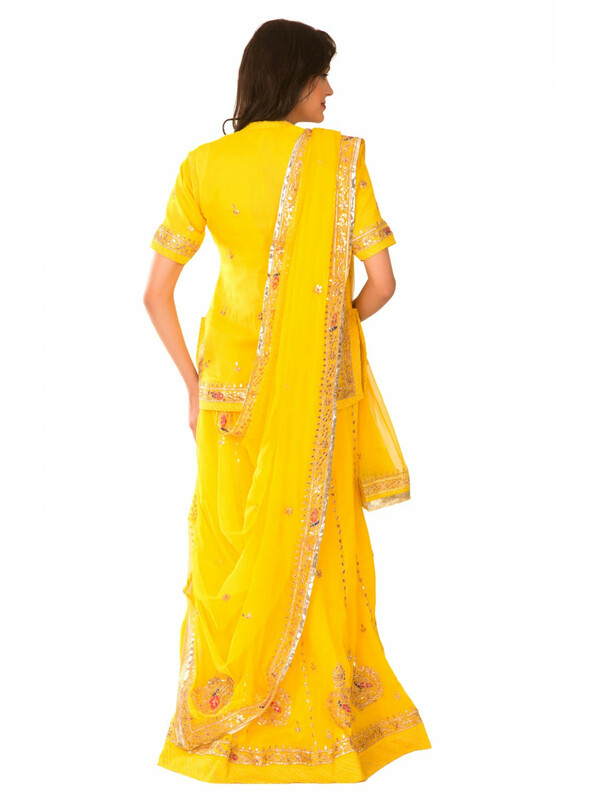 Ranas Yellow Georgette Gota Patti Kasab Resham Sequins Work Rajputi Poshkak Buy this glistering yellow piece of Rajputi Poshak from http://www.ranas.com. With the most apposite medley of the gleam and the elegance, this Rajasthani Rajput Poshak is the perfect choice for you to try at least for once. Enriched with the intricate Gota Patti Kasab Resham sequins work, this designer outfit will impart you an auxiliary charm to your beauty. Want to explore more? Go through our anthology and find more designer lehengas sarees and achieve the royal and elegant look. Find the most mesmerizing designer sarees in Jaipur at Ranas and ready to get highlighted at the occasion.